2nd May 2015 is the two hundredth anniversary of the death of Martha Gunn the famous Brighton ‘Dipper’. In the 18th century, people were often nervous about entering the sea, so ‘bathers’ and ‘dippers’ were employed to make sure their clients were not swept away. Martha (1726-1815) was from a very well-known local fishing family the Killicks. In March 1758 she married Stephen Gunn with whom she had eight children; two sons and two daughters predeceased her. 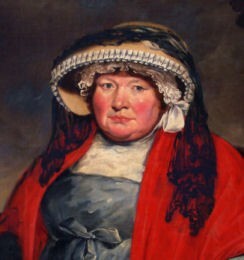 She started work as a ‘dipper’ in her early twenties and did not retire until she was an old lady.She enjoyed a very special relationship with George Prince of Wales (1762-1830) and as a result became one of Brighton’s first real celebrities. On May 1st there will be a reception held by the Mayor and Mayoress of Brighton and Hove, Councillor and Mrs Brian Fitch,to celebrate the life of Martha Gunn. Descendants of Martha and local historians with special knowledge will be present, and it is hoped that it will be an opportunity for descendants of the Gunn and Killick families to make contact. Admission is £15 and it is necessary to pre-book. All proceeds from the evening will be donated to the Mayor’s Charities as shown here. You can download all the details by clicking on the link below.